NYX Eyeshadow Base: My town recently got a NYX stand and I am beyond happy about it. The products I've tried so far I have been loving so I have a huge list of products I want to try out. The eyeshadow base is definitely at the top of my list as my eye bases are almost gone and I want to give it a try. 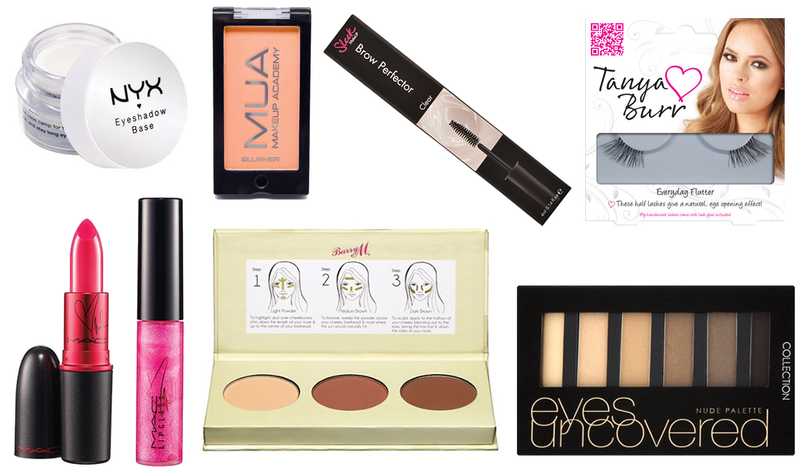 MUA Blush in Lolly: I am currently in love with this brands eye palettes and concealers/correctors so I really want to try more of their range. I think this blush colour would be so lovely coming into Spring time. Sleek Brow Perfector: I haven't tried many brow gels and the ones I have tried haven't exactly worked for me. This is a clear one but they also come in colours and because Sleek never disappoint with their products I have high hopes for this so hopefully I will be able to get my hands on it. Tanya Burr Lashes in Everyday Flutter: Every time I try to purchase this particular pair they are always out of stock so I'm hoping I can grab them soon. I love the look of these and definitely think they would look fab on. Mac Viva Glam Miley Cyrus: One of my favourite singers teamed up with Mac and I absolutely adore the colour of the lipstick and gloss. Seeing so many swatches I just fall in love with it more. Out of everything in this wishlist these two are at the top! Barry M Chisel Cheeks Contour Kit: Barry M have such great products that there is no surprise that this is on my wishlist and probably everybody elses. The colours look great and it is such an affordable price. Collection Eyes Uncovered Palettes: I want all 3 of these palettes to be honest. The Little Mix palette from Collection is one of my most used eye palettes because the quality and colours are just amazing and I assume these would be the exact same! Now just to wait for them to arrive in my local Boots store or online. Whats on your current Beauty wishlist? I need the MAC Miley gloss in my life... It looks gorgeous!